Engaging with the the little audience, discussion went along the lines of extending Polbrock by another 3 feet and incorporating the Mendip Colliery project to the right of the pub. 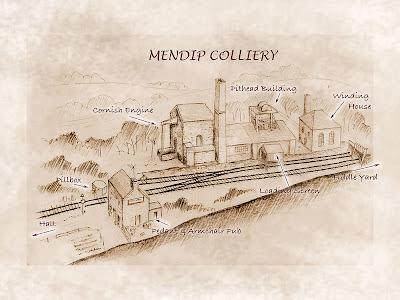 Mendip Colliery having been on and off for a couple of years now, both in print and right here in this BLOG, with readers and surfers weekly emailing me asking what's happened to it and when it's going to reappear. 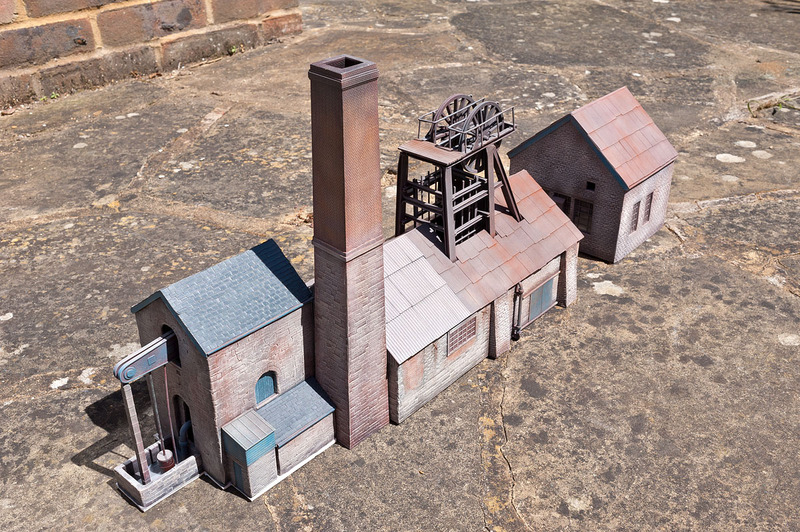 So, to get the ball rolling, earlier today I had all the colliery buildings laid out on the carpet with Polbrock and came up with the attached sketch. The through line running along the front, the colliery behind it, also with its own fiddle yard exit to suggest something more. Looking at the sketch above, that's Polbrock on the left where you can see the pontificator's favourite tipple house. Mendip Colliery buildings already made. All I need to build is the loading screen and maybe a replacement engine winding house. Polbrock simply unscrews and drops out of the display case it's currently in, so extending the total length ex fiddle yard extending to around 6 feet would be simple. I'd have to build (or extend) a bigger display case and the backscene could easily be extended and reprinted, perhaps with more of a North Somerset feel (which is in fact where the original photos for Polbrock were taken). The name Polbrock would go, and a new North Somerset inspired name would replace it. Something or other 'Gurney' could work. Compton Dando, Compton Gurney, Charlton Gurney & Asham Gurney having been suggested by a couple of fellow mudellers. Polbrock station, siding, crossing and pub would stay as is, but the SR colours would become WR brown and cream. The pub and crossing seen below would be in the middle of the layout and make a nice scenic punctuation. Trains would have a good run too. My carpet mockup felt just about right, the tall chimney just to the right of the Cornish engine would contrast really well with the halt. The halt could be named after the colliery possibly, it mostly serving the miners. Whilst the track layout will be pretty basic, luckily most of the North Somerset coal field mines were very compact indeed, the 3ft x 1ft extension being quite a limit - but it does fit just without looking too silly. The plan is be to have it ready for Railex end of May '13. It's already invited, I just needed to blag a few more feet which I've seceded in doing successfully. 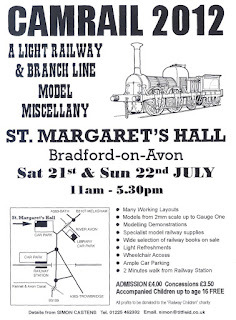 Polbrock is booked into Model Rail live (see ad top right), so work on opening up the right hand side of the layout will start in the autumn and be mini-serialised in Model Rail magazine, where I'll discuss problems of extending the layout, hopefully a few new scenic features and finally drawing a line, hopefully a happy one under Mendip Colliery. 120720_camrail12_DSC_7341, a photo by nevardmedia on Flickr. High jinx! I turn my head on Polbrock for just a second and look what happens, an O gauge pannier tank appears! 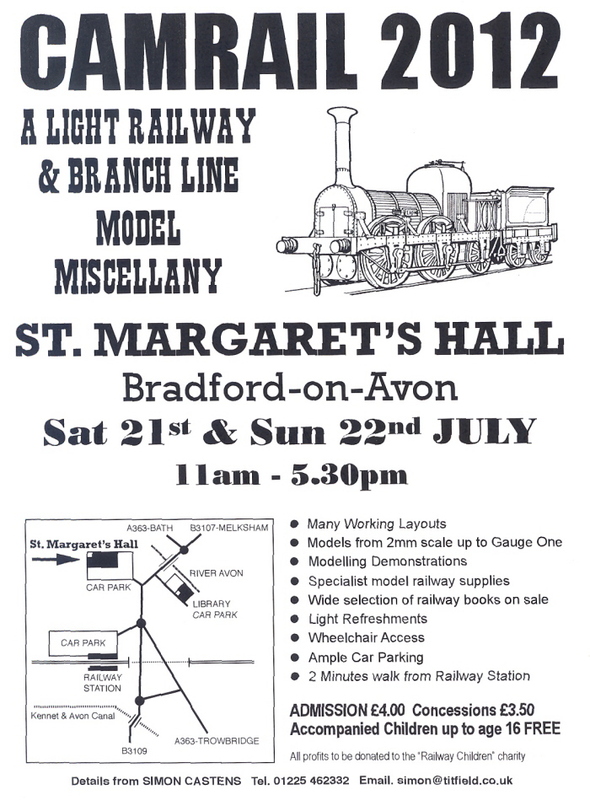 One of the west of England model railway show highlights has to be Camrail in the beautiful Bradford on Avon. 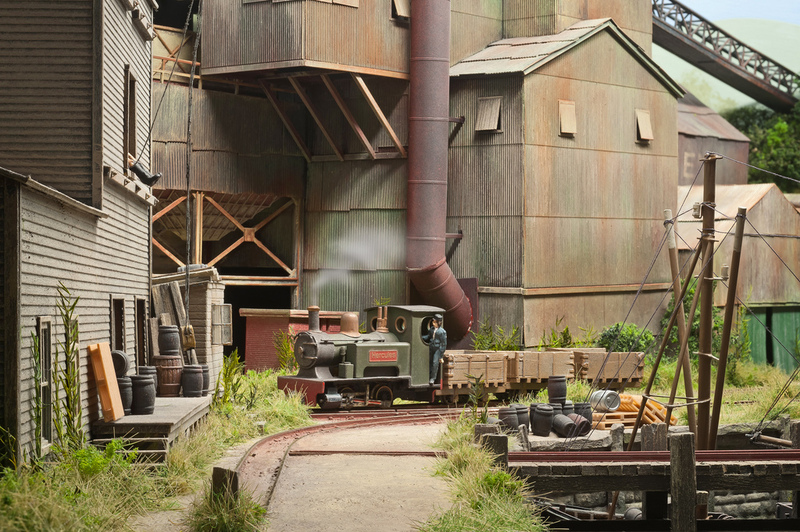 The show is the brainchild of the delightfully ebullient Simon Castens, who to many is better-known as the proprietor of The Titfield Thunderbolt bookshop in nearby Bath, a bookshop dedicated almost exclusively to railway publishing. The show, whilst certainly not one of the bigger ones in the exhibition calendar certainly has to be one of the friendliest and jolliest as I found much to my delight on what to me was my very first visit. Some shows I get the feeling that the layout operators really don't enjoy themselves too much, but at Camrail the impression of the complete opposite. Arpund breakfast time yesterday morning being a slightly cheeky mood, I popped my semi-complete Polbrock into the car and after a quick approving text from the 'Southern Railway cream' clad chap in the photo above, ('Head of catering' at Camrail) it was agreed after approval with Mr Castens that I could 'gate crash' the show. 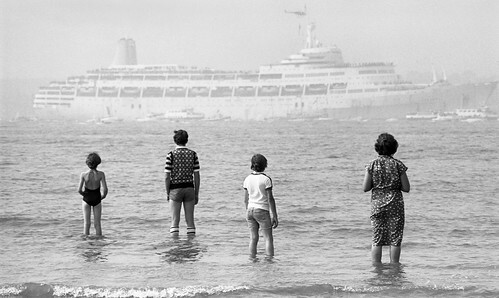 To protect the almost innocent we'll call 'The Head of catering' Captain Kernow for this post. Anyway, enough about my dodgy techniques of getting into shows, Camrail is a 2 day event with the doors opening again today, so if you're in the area or fancy a break from Britain's number one day out of going to B&Q, it's well worth the £4 entry fee. And if peckish, I can highly recommend the fresh cut sarnies and tea served by the above yellow clad gent, though I gather he's dressed in green today, Southern Railway green I hope. 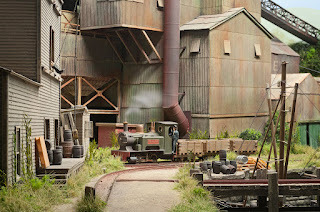 To see the other snaps I took of some of the layouts that appealed to be, follow this link. To find out more about Camrail, click here, or on the poster above. nevard_120709_DSC_6818, a photo by nevardmedia on Flickr. Continuing the looking down from the clouds, falling from an aeroplane or going up in a hot air ballon theme, here we have Brewhouse Quay in all it's 4ft x 2ft glory. This angle hopefully shows off the trackplan which I was quite pleased with, as well as a first for me building the funny 'K' shaped trackwork the engine is just about to attack. 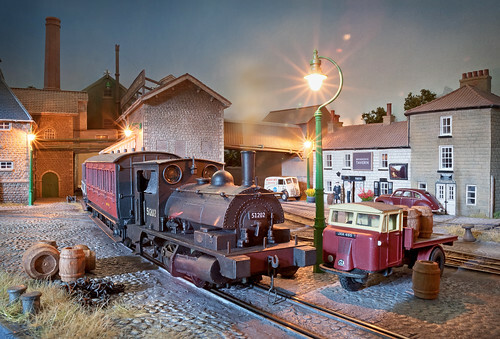 It was the result of messing about on the back of an envelope down the local pub and at the time thought unique, but recently a 2mm scale (aka 2FS) modeller was in touch to say that he built a wharf many years ago with a similar track layout called Chapel Wharf - take a look, it's lovely. This all goes to show that somethings with limited space there are only a certain number of ways tracks can be bent and split to fill a small area I guess! nevard_120708_BQ_DSC_6792, a photo by nevardmedia on Flickr. Earlier today I was going through some of old lenses that rarely see the light of day too often, and came across this 1986 vintage 28-85mm AF Nikkor zoom in the bottom of my kit drawer. AS a bit of fun I popped it onto my Nikon D700 to see how it performed on a full frame body, especially due to the very close focusing 'macro' at the 28mm end which goes right down to around 5cm. To be honest I was expecting it to perform like a dog, but was very pleasantly surprised so find that it's pretty good. Admittedly there is quite a bit of flare from the point light sources as one would expect from a complex optic when photographing scenes like the above, but not too unpleasant. in fact there's even a filter in Photoshop to produce just such an effect, this is the real thing though! Compared to more expensive pro-spec Nikkor zooms and primes, there is quite a bit of colour fringing (chromatic aberration) towards the edge of the field, but that can been totally eliminated in Adobe RAW, thus making the lens a better performer on digital capture than it ever would have been on film. With the small f-stops I shoot with, it's also very sharp right through to the corners, this is something which really surprised me for such an elderly zoom design. Barrel distortion, which most mid-range and wide angle zoom will exhibit to a certain degree at their widest settings is pretty well controlled too. As with the chromatic aberration, such is easily addressed at the RAW conversion stage. I'm so impressed with it, that I'll have to find some extra room in my kit bag, with miniature photography it's often useful to have a wide lens with good close-up. 111128_arne-wharf_IMG_1984, a photo by nevardmedia on Flickr. People often ask me about the track plan of Arne Wharf and whether it's a roundy-roundy or end to end operation, and what size it is. Click to enlarge! Not the sharp curves! The above Google Earth inspired view should hopefully help here, and what you're seeing is on a footprint of just 24 x 36 inches. The little spur top right is served by a little fiddle yard which folds down, but it's not necessary if you just what a train to run aroud and round. I almost forgot the scale, it's called 009, which is 1/76 running on rails that are 9mm apart - that equating to 2ft 3 inches, which is known as narrow gauge. Why 9mm? This is to take advantage of N gauge mechanisms. The minimum radius is a nother question often asked, all I can say is that it's quite tight, the siding bottom left only really being suitable for 0-4-0 locos and short 4 wheeled wagons. At a guess the gauge is probably in the region of a 5 inch radius, maybe less, but I do know that a dinner plate was used as a template! In 009/narrow gauge it works well, but can limit what locos access which areas - but that's half the fun! For more photos and little more about Arne Wharf follow this link HERE! For even more info, folllow the Arne Wharf link at the bottom of this post for further blog postings. 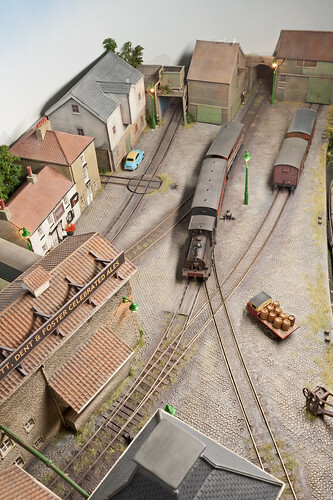 Arne Wharf will be at Model Rail Live 22/23 September at Barrow Hill Roundhouse - follow the link top righ of this page. nevard_120703_polbrock_IMG_3812, a photo by nevardmedia on Flickr. With a name change, the Cornish inspired Polbrock seen here with a Midland 3F could easily be somewhere around the Welsh borders on some long lost Midland/GWR backwater, the weed ridden track and wagon which looks like something that would have been seen around Tintern Quarry helping the geographical move. The overgrown track and little used siding placing the scene firmly within a year or two of closure. The halt looks like it lost its passenger service some time ago, or if it hasn't, the trains must only call very infrequently. 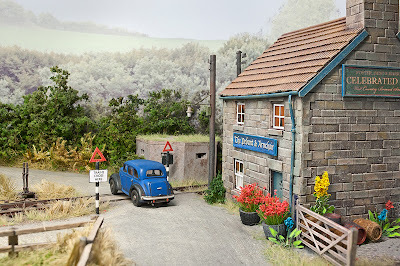 I'm currently photographing and writing for the final instalment of Polbrock which is currently being serialised in Model Rail magazine, the series covering the construction from start to finish of this little layout. The whole story is being squeezed into around 24 or so pages over 4 issues, which is probably enough for any magazine without it getting tardy and draining like these 'diaries' type features all too frequenty can be, remembering the reader most likely hasn't specifically bought the magazine to read about my fumblings. I must admit what to write about, what to leave in or out, has been tricky, for it would be quite easy to fill a book if I detailed everything, so I have tried to tackle the aspects that are important to me. 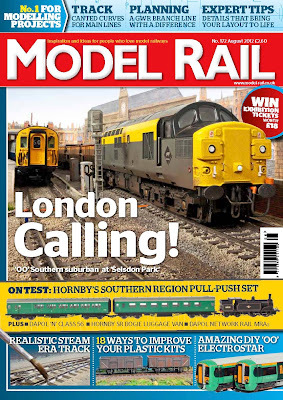 There are almost certainly better ways of tackling some of the bits that I've built, so from that point of view I really look forward to feedback from readers whether via my website or 'Editor's desk', for railway modelling is always a learning process, however far down the road we are. Equally if I've helped somebody get around a problem or inspired somebody to throw out that threadbare armchair out I'll be even more happy! 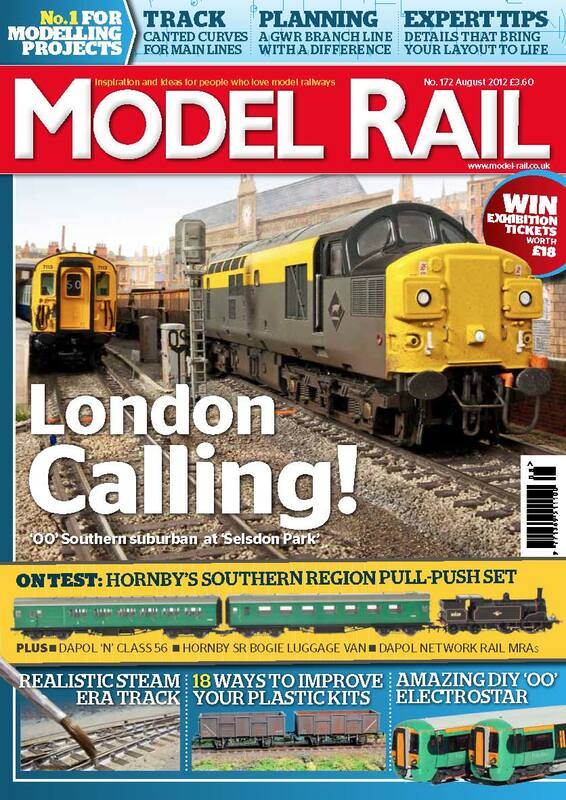 On the road; over the past couple of weeks, Polbrock has 2 confirmed outings, kicking off with Model Rail Live in September at Barrow Hill Roundhouse (click the logo top right of this page), followed by the highly acclaimed Railex at Aylesbury Stadium at the end of May 2013.